With crowdsourcing from social media surging in popularity, companies are now turning to their online communities to seek feedback on new offerings, where to open up new locations, and more. So, why is it so surprising that an NBA team would use the internet to seek out superfan data experts to help crowdsource its 2014 draft picks? Quite simply – it hasn’t been done before. 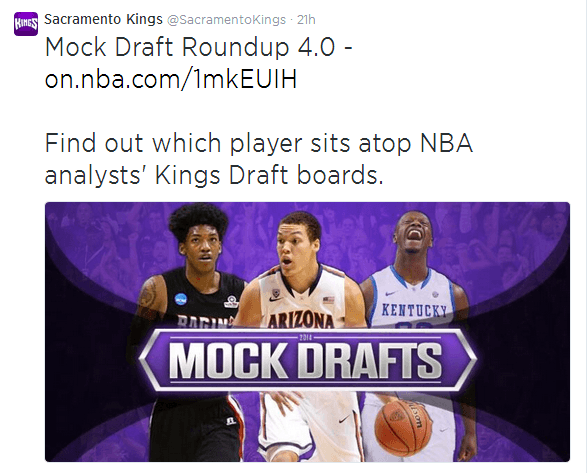 This is precisely why the Sacramento Kings are taking a radically different approach to the 2014 NBA draft. According to GM, Pete D’Alessandro, like many other teams in the league, the Kings are faced with more data than ever before. Processing this volume of data and analyzing it in a way that helps the team make informed decisions is both a challenge and an opportunity. As a result, the Sacramento Kings are disrupting their data analysis process. The team sees an opportunity to test new methods of collecting and interpreting data by crowdsourcing information from NBA superfan data experts around the country. In order to find the best data experts for this initiative, the Kings first turned to the internet to seek out individuals who were not only qualified, but were big fans of the sport and team. From all of the submissions the team received, the Kings selected nine people to be part of their 2014 Draft team. The team selected includes a range of data experts, from undergraduate and graduate students, to IT Consultants and even a Quant Fund Manager. Each individual on the 2014 Draft team is featured in a video produced by the Sacramento Kings and Hock Films where they are seen interacting with team management and coaching staff. The video is just over ten minutes long with the tone and storyline of a documentary. The video is shot in a way that feels realistic and honest, yet adds a layer of suspense. You can’t help but watch the video and wonder if the crowdsourced approach will work and what direction it will push the team in. It’s also interesting to listen to the crowdsourced analysts discuss how their data was collected, plus the recommendations provided. 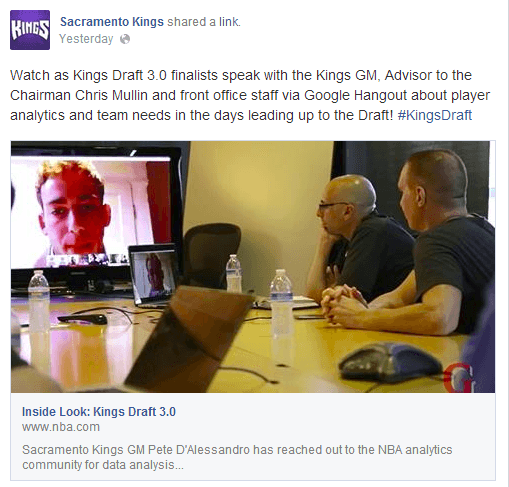 Throughout this process, the Sacramento Kings have also been using Facebook, Twitter, Instagram, and YouTube to keep the NBA Draft top of mind with its fan base, from interviews with potential draft picks, plus special content on NBA.com. Will the team keep their 8th round draft pick? Will they trade their pick? Who will get drafted to the team? Tune in today to find out who the Sacramento Kings ultimately select in the 2014 NBA Draft.